Whalley had a mixed weekend as they went down to champions Clitheroe in the league, before knocking Salesbury out of the Ramsbottom Cup. The Station Road side have had a stop-start season so far, with a free date in the opening round of games, and their second fixture at Oswaldtwistle was rained off. They beat Great Harwood in between, and skipper Richard Lamb has been relatively pleased with the way they have opened their campaign. Veteran bowler Dave Howard retired over the winter, which was “a big blow”, but in Simon Gorton, they still have a potent, experienced bowler, and he took 6-46 against Clitheroe on Saturday in the 62-run defeat. “We’ve had a good start, we picked up a good win at Great Harwood, but came up against a very strong Clitheroe on Saturday – they will be favourites to win the league again. “We took some positives out of the performance though, and, even with a few players missing, got a good result against Salesbury. Whalley look to go again at home to Settle on Saturday. 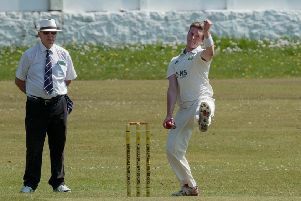 While Gorton took six wickets for Whalley on Saturday, Salesbury’s Josh Bristol produced the most remarkable bowling performance of the weekend. Bristol took 6-1 as Ribblesdale Wanderers were dismissed for just 65, with the Red Caps knocking off the winning runs with one wicket down. Bristol’s haul came off just three overs, with his final three wickets coming in just four balls! Salesbury host Banoldswick on Saturday. Wanderers also lost out on Sunday as the holders exited the Ramsbottom Cup in a re-run of last year’s final against Cherry Tree. They were dismissed for 154, before Ferisco Adams hit 54 in a three-wicket win. Great Harwood are the visitorsd to Church Meadow on Saturday.